So, still on the topic of dry skin as it's still winter and the temperature here in NYC/ NJ has been super cold and dry! I'm always looking for different ways and products to keep my skin moisturized and healthy looking. Most times in the winter especially, I use body oils in my shower /body care routine. That seems to be one of the few things that really locks in the moisture in my skin. When I first heard about Butter Elixir, I had to do a quick research to see what products they have, background of the founder and what ingredients are in them. Few things that struck me about butter Elixir is that they are a NEW YORK brand! (Hi Neighbor! ), the website has good information, their products are 100%natural and the founder seems passionate about skincare and her products. So why not, I decided to give Butter Elixir a try when they reached out. 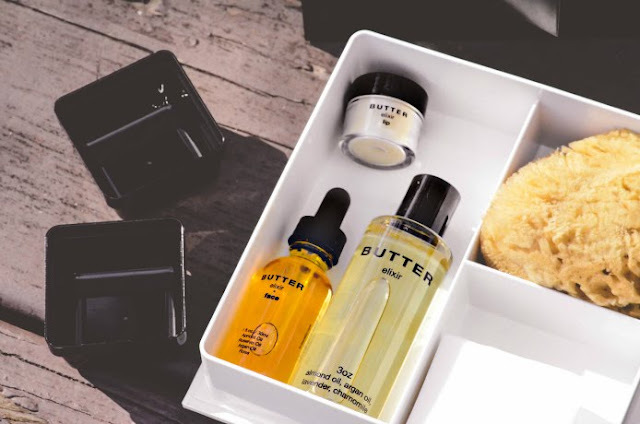 About the brand: BUTTERelixir is a New York based high-quality unisex product line, that was created for people in search of pure and simple skin care. They have a product range of oils for body and face and also lips and are made with 100% natural ingredients to maintain its high quality. The have bundle packages that look great for gifts. BUTTERelixir mission is to make you feel good, beautiful and clean. So, I decided to take the BHAKTI BODY OIL for a spin in the SFD Review world. Test it out for a month and here I am back with a review that is a must read before you purchase! Ingredients: Virgin Organic Sesame oil, Jasmine, Mysore Sandalwood and Myrrh Pure essential oils. 100% natural. Description:This BUTTERelixir Bhaktibody oil is a luxe light weight oil that quickly absorbs into your skin and restores its healthy look. It has a rich texture and after using it my skin feels so soft and velvety without being greasy. Like most body oils, it can also be used as a massage oil and bath oil. I like to use it right after I get out of the shower, while my skin is still damp. It prevents my skin from drying out quickly or even getting ashy. Because it quickly absorbed, your body doesn't look super oily after applying your lotion over it. This body oil allows your skin to stay hydrated all day making you brighter, radiant, softer and healthy. My Experience: I decided to try the Bhakti oil out for one month and for most days, I used it twice a day, because I would go to the gym, shower and reapply the body oil again. This prevents me from waking up white and ashy. I love using natural oils because you can almost feel and see your skin transform. You know you have to feed your skin the healthy stuff! SO everyday, after I shower, I would lightly use a towel to dab my skin, so it doesn't take off all the water, then I would pour some of the Bhakti oil on my hand and rub it into my whole body neck down to my feet. Remember that using a little goes a long way. It then absorbed quickly into my skin, allowing it to look radiant, like a soft glow. I keep it on for about 3-5 min before I then apply my body lotion all over again. After this process I don't find the need to reapply lotion through out the day. My body stays moisturized all day! The oil is said to be relaxing and calming but I really didn't pick up on that. But what I can say is that, due to it being light weight, natural and helps with maintaining the moisture in our skin, it can be used on all skin types. The one thing I didn't like about the oil is the scent. This could be because I like flowery scents. I'm not really a big fan of certain scents, and unfortunately that sesame oil smell is one of them, felt too potent. But on a good note, because it quickly absorbed, you can barely smell it on you after a few minutes. It didn't interfere with my body lotions scent, which was good. Final Thoughts: Overall, it really improved my skins texture over time, making it look very velvety and very soft. Also, it gave me the nice soft glow I like on my body, which was great. I like the fact it was made with 100% natural ingredients made me feel safe. This is surely a good product that I think would work well in any weather. If you want that luxury, soft skin, radiant look, this would be a great body oil choice for you. Lightweight oil that absorbs well. Will work with all skin types. Has a strong sesame oil smell. To celebrate the first Product Review for 2017, I am giving away BUTTERelixir Face Oil, (Value $42) to one lucky winner. No purchase is necessary to enter. I really love the body oil and think you would love the face oil too. If you would like to try it, enter our giveaway below for a chance to win. 2- Leave a comment: What is your favorite body oil? Giveaway ends Feb 01, 2017 at 11:59 p.m. EST. Winner will be notified via email and announced here on this post within 72 hours after the giveaway closes. P.S. This giveaway is opened internationally only where not prohibited by law. My favorite body oil is the Rodin Luxury Body Oil. Love it! Sugar Ultra-Nourishing Body Oil from Fresh! love it! I have an all natural almond oil that I have recently started using. I use vitamin E oil, but still continue to have a few dry patches! My favourite body oil is The in scented Shea butter oil from R&R Luxury. It works wonders for my skin! I've used a bunch over the years... a mix of shea butter and coconut oil, Neutrogena body oil, Bio oil, more recently the Radha beauty fractionated coconut oil and rosehip oil.... So hard to pick a fav... All very good. Coconut oil so far has been the the only thing to keep the winter hashiness away. My favorite body oil is coconut oil from Trader Joe's. I have been using coconut oil. I love Emu and rosehip oils to help with my acne scaring and more healthy radiant skin. My favorite oil is coconut oil. I apply to damp skin. Roxyfox32 on IG I've been using Emu and rosehip oil to help with my acne scaring and for more radiant nourished skin. I don't know that I have ever actually used a body oil. I use these natural oils in my daily skin care routine in order to make my skin nourished and healthy also these oils help us in moisturizing and cleansing the skin properly. Thanks for sharing such an informative information. I have never used this product before but surely I am going to include this product in my skin care routine. I hope this will definitely suit my skin. I hope this will make wonders to my skin. By sending your kids to school with nutritious lunches and encouraging healthy choices for school events, you can also help to create a healthy nutritional environment in schools. It is important to know our options and although these health concerns may seem cringingly horrible and painful, reconstructive procedures are available to save lives. Berries and citrus fruits are especially good for skin because they are packed with vitamin C, which helps restore a glow to skin and slow ageing.